HD Free TV Antenna: Is It Worth Your Money, Time, And Effort? Today more families are deciding to ditch their expensive cable or satellite TV services than ever before. The surge in popularity of streaming TV services such as Netflix, Sling TV, HBO Go and Amazon Prime Video make paying a high monthly subscription bill to a cable provider seem unpractical. The cost of cable or satellite TV has reached outrageous amounts, with some homeowners paying out as much as $200 or more per month, just to watch a standard line up. If you have reliable high-speed Internet service, and are still paying for cable TV, it is time that you learn more about your options including streaming channels and Free over-the-air HD TV. Over-the-air channels have always been around. They provide us with local news, weather reports, and some of the best entertainment on TV. All you need to access these channels is a quality antenna such as the HD Free TV antenna. What is HD Free TV and How Does It Work? What Makes HD Free TV so Unique? What Do Consumers Have to Say About HD Free TV? How Does HD Free TV Compare with Similar Products? Is the HD Free TV Digital Antenna a Good Way to Enjoy Free Television? In 2009, when the FCC mandated that all U.S. based television signals must be transmitted digitally, those who relied on over-the-air reception for their TV viewing were treated to an abundance of new free channels, and even today, more channels are being introduced. There are so many options for Free TV now that a large percentage of households have decided to cut the cord with their cable provider and switch to Free TV. The main thing that you need to access all the free HD channels in your area is a good antenna. The HD Free TV Antenna is advertised as one of the best HD antennas available. It can provide you with access to all the major networks including ABC, CBS, NBC, FOX, Ion, CW, PBS and more. The HD Free TV Antenna is easy to install and works with any TV that has a coaxial cable input. All you need to do is attach the antenna to any window, nearby wall, or door. Any type of flat surface will do. The thin and compact design of the antenna makes it easy to conceal so that its out of sight. Next, you need to connect the antenna to your TV’s AUX/IN and then use your TV remote to scan for channels. Based on the ads for this product, you should be able to pick up more channels with the HD Free TV antenna than any other indoor or outdoor antenna that you can buy. But there can be some limits to that claim. ​The HD Free TV antenna is a unique product because it is so easy to install and simple to set up. You can use it on any TV with an AUX/In connection, in any location such as a boat or RV. This antenna is designed to pull signals from all directions, so that you don’t have to adjust it to get in a channel. And you can watch TV in any room in your home without any additional cables or boxes. Considering that you must pay extra each month to have a receiver in every room with most cable TV providers, this antenna can save you and your family hundreds of dollars each month. Did you know that you may not be getting HD quality picture from your cable provider? If you are using a standard receiver, and you do not pay extra for HD channels, you are only viewing your favorite shows in standard definition. And that is not what your HDTV was designed for. By connecting the HD Free TV antenna to your television, you can enjoy the crisp and clear high-definition picture that your TV was meant to display. All major broadcasting networks are available to you, which means you will receive quality sports, drama, sitcoms, news, and more, all in high-definition. The HD Free TV Digital Antenna is an affordable option when you are ready to eliminate the high cost of cable TV from your life. The antenna retails for just $ on the official website and may cost even less if you can find it on Amazon or at your local retailer. That is a very small price to pay for endless TV shows, movies and sports that you don’t have to pay a monthly fee for. The HD Free TV Antenna has some mixed reviews from consumers. There are plenty of good reviews for the product from people who would recommend the antenna to others. But there are also some reviews where users complain that the antenna stops working or doesn’t provide them with the reception that they expected. If you take the time to read the customer reviews for this product, you will learn about the different tips and tricks that others have used to get more channels from the antenna. The higher up you place the antenna on a window, the better your reception will be. While it’s important to learn how well the antenna works for other users, you should also have a general idea of how any type of digital TV antenna functions to better understand how to use the product and get the best possible outcome. ​Users should keep in mind that this antenna works like any other, and therefore you will lose reception from time to time due to bad weather and other factors. 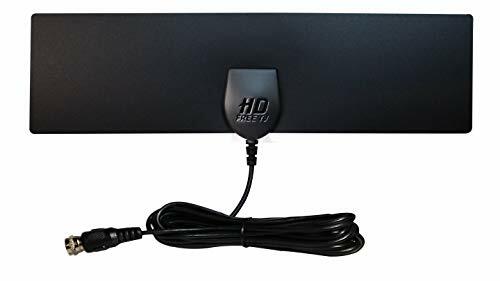 But overall, most will agree that using the HD Free TV Digital Antenna is much better than paying out hundreds of dollars each month to watch the same content. When you order one of these products from the official website, you will receive one HD Free TV Antenna that costs $. You will need to pay $ for shipping. You will have the option to add a second antenna at checkout for free, and only need to pay an additional $5.99 shipping charge. All HD Free TV antennas come with a 30-day money back guarantee, shipping costs are not refundable. To request a refund, you will need to call Inventel’s customer service department. While this product has received some negative reviews, it is still worth checking out, especially since there is a money-back guarantee. It’s important that consumers have a good understanding of what they are buying when they purchase this digital antenna, such as what they will and will not be able to do with this new device. The main reason why this product has received so many negative reviews could be due to the misleading TV commercial. It claims that you can use this antenna to enjoy all your favorite TV shows without paying the additional cost to your cable company. The ad depicts this antenna as one that is so powerful that it can provide you with hundreds of free digital channels. It would be easy for some consumers to believe that this product would actually provide them with cable channels for free, based on the information in the ad. But that is obviously not the case. For starters, while you do receive national broadcast channels and some new digital channels that were recently added, you do not receive cable channels for free. Some of the newer digital channels now syndicate popular cable shows, but these are always reruns. Fortunately, if you have reliable Internet service, you can take advantage of the many streaming channels so that you don’t have to miss out on your favorite cable TV shows. The price that you pay for these monthly subscriptions plus the HD Free TV Antenna are dramatically less than what you would pay in a single month for cable or satellite services. There are countless other HD TV Antenna products available online and at your local retailer. When it comes to the price, the HD Free TV Digital Antenna costs much less than many of those in the same class, which often cost at least $20 to $30 or more, depending on the range of the antenna. To find out how well the HD Free TV antenna performs when compared to similar products, that is one thing you may have to find out by using trial and error. There are so many factors that determine how well you pick up channels inside your home. And the type of antenna you use is one of the most important. The height of the antenna, how far you are located from a broadcast tower, how clear the view is and the amount of metal surrounding your antenna can all help or hinder your antenna’s ability to pick up channels. That is true whether you are using a HD Free TV Antenna, or one that cost much more that your purchased from your local retail store. The best thing about the HD Free TV Digital Antenna is ideally the price of the product. It is a great price for a digital antenna that is so small and easy to install. The fact that it can be placed on a window or any other flat surface inside your home allows you to place it in the best place to receive the optimal signal. You can experiment with locations and move the antenna around easily to find the best spot for your favorite channels. An antenna can be a difficult product to review because more than half of its performance depends on factors that the antenna cannot control such as the location of your home or the current weather situation. Those who are pleased with this product seem to have no complaints about it, and those who are unhappy with it often have the same criticism, that it doesn’t provide them with the number of channels or clear signal they expected. It is worth mentioning that if you are expecting this antenna to provide you with your favorite cable channels such as USA, Disney or CNN, you will be disappointed. This antenna will only provide you with the current digital over-the-air channels that are available in your local viewing area. At this time, you can’t pick up any type of cable channel for free, regardless of what the commercial for the HD Free TV antenna implies. As long as you ignore the information in the commercial, yes, this product is a great way for you to enjoy plenty of HD programming for free. Keep in mind that the antenna will not provide you with access to any digital channels that are not already free. And if you are unsatisfied with the product, you will still be out $ for non-refundable shipping and handling costs (if you chose to buy two antennas). Those who are skeptical about buying the HD Free TV antenna should only buy one from the official website and pass on the deal for the second ‘free’ antenna. That way, if you decide to return the antenna, you will only be out $5.99 instead of $. And if you are happy with the product, it only costs $ to buy an additional one later. If you would like to learn more about what HD channels are available to you for free when you use the HD Free TV antenna, or any other type of antenna, you can visit Antenna Web for a full lineup of channels based on your zip code. If you are happy with only watching broadcast network TV, then this antenna should be a great product for you, as long as it is able to pick up a decent number of digital channels. And if you miss your favorite cable TV series, you can always look into streaming options using an Amazon Fire TV Stick or Roku Box that can easily be added to your TV. The HD Free TV antenna is a unique product because it is so easy to install and simple to set up. You can use it on any TV with an AUX/In connection, in any location such as a boat or RV. This antenna is designed to pull signals from all directions, so that you don’t have to adjust it to get in a channel. By connecting the HD Free TV antenna to your television, you can enjoy the crisp and clear high-definition picture that your TV was meant to display. All major broadcasting networks are available to you, which means you will receive quality sports, drama, sitcoms, news, and more, all in high-definition.